The church roof is covered with solar panels that Cooperative Energy Futures, an energy efficiency and community-owned clean energy cooperative, designed as the first of their many community solar projects. At 200 kilowatts, these panels will power the temple and 20 homes that have subscribed to the project. Plus, thanks to the vision of Cooperative Energy Futures, the panels have done more than provide a source of clean energy — they have created jobs, trained local workers for these jobs, and above all, they tell an inspiring story about the power of democratizing our energy system. In May, John Farrell visited the solar garden and interviewed Timothy DenHerder-Thomas, general manager of Cooperative Energy Futures. The two discussed final stages of the project, the justice perspective that makes it unique, and other projects Cooperative Energy Futures has lined up. The process to create a solar garden on top of Shiloh Temple began three years ago and was just completed this spring. Like most community solar programs, this garden sells subscriptions to electric customers, who then get bill credits for the amount of electricity that their subscription generates. (Shiloh Temple, like many other projects, was enabled by Minnesota’s landmark community solar law). However, the vision for the Shiloh Temple garden extends well beyond that of other community solar to emphasize equity and maximize local benefits. Now that the project is complete, DenHerder-Thomas and Cooperative Energy Futures can say that they have not only met their goals, but surpassed many of them. For a more detailed history of the Shiloh temple project, listen to this 2016 podcast. Racial injustice has always been a part of the U.S. energy system. For example, within the coal industry, it is well-known that low income communities and communities of color are statistically more likely to live near coal plants. This has direct consequences to these vulnerable communities because of the toxic pollution and resulting health problems associated with living near coal plants. Many of these inequalities were established long ago, but they are still being reinforced today. Even as more of our energy supply moves to renewables, there is no guarantee that the transition will right past wrongs or solve existing inequities — in fact, it is quite possible that this transition will perpetuate existing disparities. Decisions regarding where renewable energy is built, who has access to it, and who is hired to construct it, affect whether the energy system is equitable. The reality is, even today, disparities in the renewable energy sector exist and can be measured. 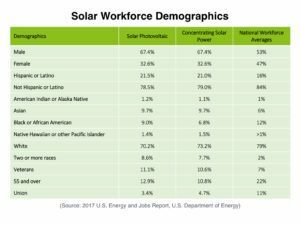 According to the 2017 U.S. Energy and Jobs Report by the U.S. Department of Energy, the majority of solar photovoltaic workers are white (70.2 percent) and two-thirds are male. Black or African American people represent 25% fewer workers in the solar industry than their presence in the national workforce. For women, the disparity is nearly 30 percent. The data for Black or African American people is especially alarming because they are disproportionately unemployed. If workforce disparities are not addressed intentionally, the established patterns will continue to be. 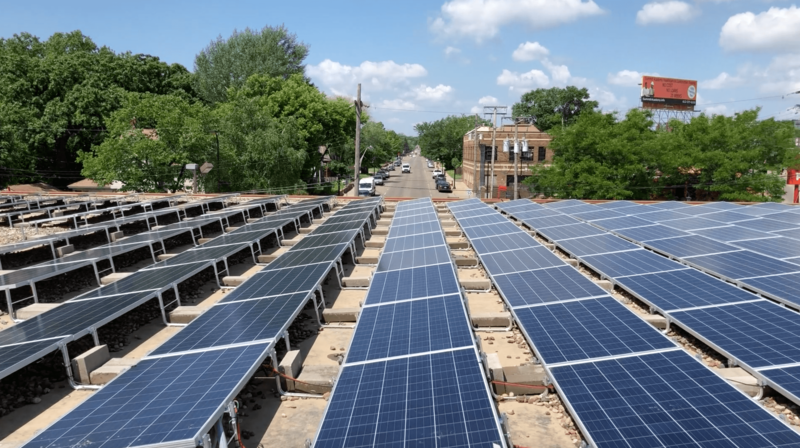 As part of their effort to address racial disparities in the solar workforce, Cooperative Energy Futures is working with Renewable Energy Partners to develop a job training program in North Minneapolis. This will ensure that “more people are qualified for those jobs as we create demand for the hiring,” said DenHerder-Thomas. 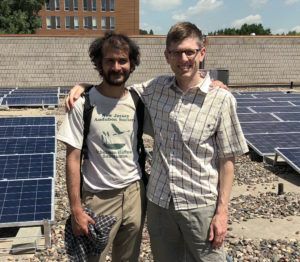 In addition to the work of Cooperative Energy Futures and Renewable Energy Partners, Minnesota Interfaith Power and Light helped engage other faith communities in the project. Shiloh Temple International Ministries and Kwanzaa Community Church have brought their congregations into the project and encouraged them to be subscribers. The North Star Chapter of the Sierra Club and Neighborhoods Organizing for Change helped with community organizing. Community solar, despite all of its benefits, has traditionally been out of reach for many. Due to the location of the gardens themselves and credit score requirements for subscribers, “low-income families, as well as statistically most people of color, are excluded from participating in community solar,” said DenHerder-Thomas. However, people with lower incomes spend the highest percentage of their income on energy. “The people who have the most to save from the financial benefits of community solar have largely been excluded across the state from participating,” said DenHerder-Thomas. They allowed residents of North Minneapolis or members of Shiloh Temple to subscribe before opening the program up to others, while also having no minimum credit score to become a subscriber. Want to know more strategies to broaden access to community solar? See here. 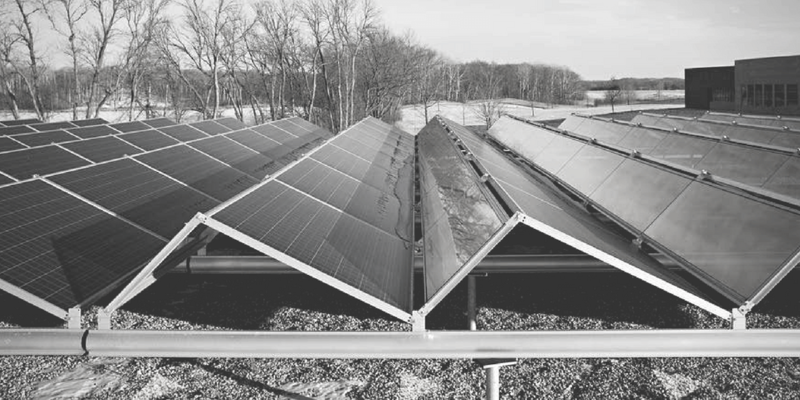 While Minnesota could do more to ensure equal access to solar energy and its benefits (see ILSR’s comments here), the state has key policies that enable projects like the Shiloh Temple community solar array. 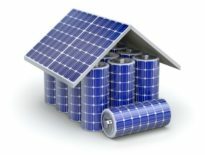 Minnesota is one of 16 states that currently allow shared renewables, also enabled by “virtual net metering.” When a state allows virtual net metering, electric customers can offset their consumption by electricity generation that is located off-site — as long as the generation is happening within the utility company’s area of service. For more information on shared renewables and which states have this policy, see the Community Power Map. 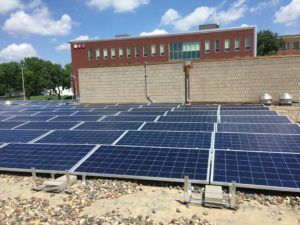 In the interview, DenHerder-Thomas discussed another key Minnesota policy: Minnesota requires Xcel energy to connect community solar projects to the grid and provide adequate bill credits. Thanks to these policies, as of summer 2018, Minnesota had 379 megawatts of installed community solar capacity. For monthly updates on Community Solar in Minnesota, see here. The Shiloh Temple solar garden is just the first of many solar installations for Cooperative Energy Futures. 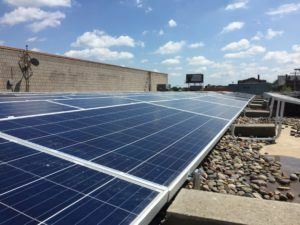 They also have rooftop projects planned for Edina and Eden Prairie, along with four ground-mounted community solar installations in greater Minnesota. Lastly, Cooperative Energy Futures is working on a large canopy solar installation over Parking Ramp A in downtown Minneapolis. The parking ramp is right next to Target Field, giving it the potential to serve as a public education resource, in addition to providing a substantial amount of power. According to DenHerder-Thomas, the total capacity of the cooperative’s eight arrays is 6.7 megawatts, or 33 times the capacity of Shiloh Temple. Once all of these planned projects are completed, Cooperative Energy Futures will be powering up to 700 households throughout Minnesota. More importantly, they will set the standard for how to do community solar for the maximum community benefit, equitably.